Today I took a step forward on my bedroom project; one small step for a project, one giant leap for lazy people everywhere. Yeah, you may recall that my bedroom has had sa-weet unpainted crown moulding for over a year because I've been too busy (lazy? distracted?) to prime and paint. I always have an excuse -- oil-based primer is stinky, so I wanted to wait until the weather was better and I could open my window to air it out. Then I didn't have any brushes in the house. (I use them once for oil-based paints and toss them. Did I mention that I'm lazy?) Then I had the brushes, but it was a Tuesday. Then my horoscope told me not to make any drastic changes. All completely legitimate excuses, right? Oh... you thought I had painted? Or even primed? Nah -- it's a Tuesday again, guys. Also, I've put this project off for so long that if I rushed it by being too on task, I might disturb the balance of the universe. Or something. Anyway I caulked, and that has to count for something. I waited way too long to start this project -- holy procrastination, Batman. This summer has been almost entirely unproductive, unless you're counting iced tea consumption and books read. I hope you've enjoyed a similarly lazy summer. I really need to dust my chandelier. But I'm pretty sure I can't dust on Tuesdays either. Darn. HAHAHAHAHA.....a gal after my own heart! Procrastinate away. Winter is coming and there will be lots of indoor time. Just came across your blog and had to giggle a little. It's so unbelieveably comforting to know I'm not the only blogger in the world that is slow as molasses finishing projects. 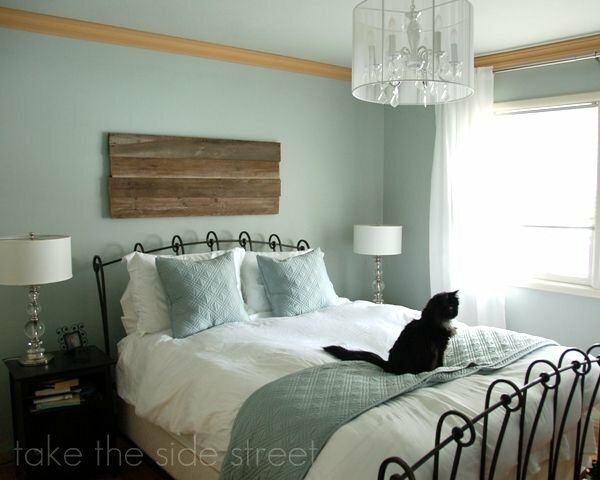 Your lovely bedroom and its almost lovely crown molding reminds me of my office and my guest room and my kitchen...it's a marathon not a sprint! Looking forward to checking out your progress. The rest of your bedroom looks great! LOVE the wall color! That's awesome! Hey, it's one small step but at least it's a step. I have to paint ALL the trim in our house. I'm dreading that project! this is sooooo me. 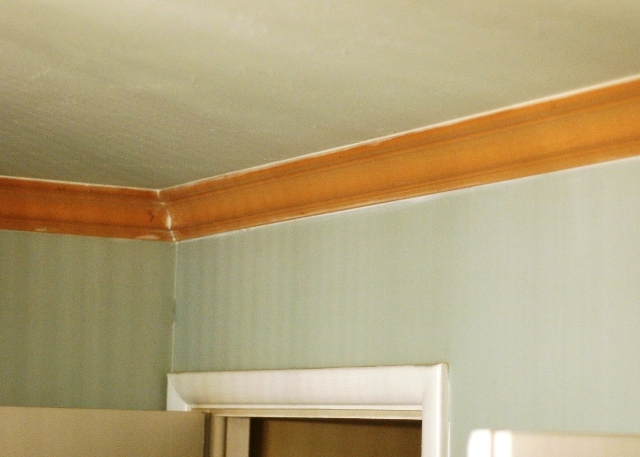 the paint trim on one wall by the ceiling has been totally jacked up for about a year and a half. every time i walk into the room (it's our family room so, that's like at least 95 times a day) i'm all 'ugh' when i look at it. it's a streaky mess. but, kardashians are usually on so, streaky mess it stays. Just found your nice blog. Aren´t we all like that, some projects seems to take forever to finish. Where did you get that ceiling light fixture? It's from overstock.com -- they have a version with a black shade, too.